LiveCode LessonsData GridLiveCode Data Grid Working With Data Grid TablesHow Do I Resize Columns? Select the data grid and open the property inspector. 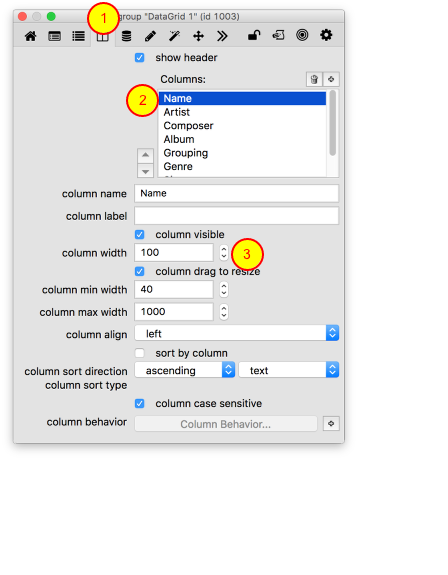 Navigate to the Columns pane (1), select the column you want to modify (2), and set the width of the column using the Width text entry field (3). You can set the size of a column by setting the dgColumnWidth property for the column to an integer. Prev: How Do I Sort By A Column? Next: How Do I Override the Default Behavior For Rendering Data to a Cell? How can I resize all the columns of datagrid from code? One way you can do this is to set the "column widths" property of the Data Grid, This allows you to set all column widths at once, you set the property to a comma delimited list of integers where the items in the list are the widths of the columns e.g. set the dgProps["column widths"] of group "DataGrid 1" to "50,100,150"